Workshop: The Leader's Journey - Discovering Your Leadership Impact from Ready2Go Marketing Solutions, Inc. Leaders are often perceived as those who hold powerful positions or titles. But true leadership is a matter of recognizing your impact and taking responsibility for that impact regardless of your job title or status in life. True leadership is not about a function of the title or position you hold. It doesn’t matter if you are the leader of a corporation or you are teaching your child how to tie his shoes – you are always having an impact, large or small, positive or negative, and you are responsible for that impact. In the end, it is about shifting your mindset to see that you are a leader, regardless of your title or lot in life, this is the first step. This 3 hour workshop has 6 interactive exercises/activities and is a perfect addition to the other Leader’s Journey, Discovering Your Leadership Impact products. 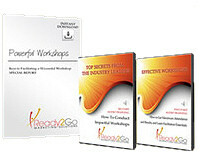 The information in this three hour workshop compliments, but does not duplicate the products in the suite. Impact is at the heart of leadership. This component starts with an activity where participants begin to experience the power of impact. What are the qualities of the best leaders and of the worst leaders? What impact do these qualities have? This component includes an activity entitled, “The Best and the Worst” where participants identify best leadership qualities, the worst leadership qualities, and the impact of each. What happens when you are in a situation that calls on your worst qualities and your best qualities? This component includes an activity entitled, “Cross the Line” where the participants use their worst leadership qualities to achieve a goal and then compare that experience to one where they use their best leadership qualities to achieve the same goal. What leadership style do you naturally prefer? What is the impact of that style? This component includes an exercise entitled, “What’s Your Style?” where participants self-assess their leadership styles and explore their impact. What skills do you naturally possess based on your leadership style? What skills would you like to develop? This component includes an exercise entitled, “The Leadership Skills Wheel” where participants identify one skill they would like to develop and come up with development strategies. This component includes an activity entitled, “Leadership is…” where participants define leadership based on what they have learned during the workshop. This component concludes with a homework activity in which the participants will create a development plan to deepen their leadership skills. By the end of this workshop, participants will have identified their leadership preferences, the leadership approach needed for their unique situations, and the skills needed to succeed as a leader. They will have also determined areas in which they already possess leadership traits and skills, begun to notice their leadership impact in a way that will take them to the next level, and identified areas where they will benefit from further development. Leadership is not just a topic that is relevant to the workplace or for people in management positions. Leadership applies to all personal and professional situations, organizational settings, families, relationships, and each person’s own life. We are all leaders, regardless of whether we have an official title or in a leadership position. We are leaders just by living life day to day. Recognizing that at the heart of leadership is the concept of impact. How I define leadership influences how I show up as a leader. My impact on others is the true measure of my leadership. Gaining self-awareness about my natural leadership styles and skills. Each of us has natural preferences, and we often create a leadership box in which we get stuck doing the same ineffective things. When we gain clarity about those preferences and the boundaries of our leadership box, we empower ourselves to step beyond the box with courage and self-compassion. Expanding my ability to lead by identifying the leadership skills that need development. Leadership is the intersection of who I am and what I do well. When I lead by leveraging who I am and what I do well, I empower myself to lead effectively and I bring out the best in others. As a leader, I must always be developing my skills – both my strengths and my challenges. Establishing a plan to enhance my leadership skills. Leaders must commit to developing themselves. Without a plan, it is less likely that I will commit to developing my leadership skills. As a leader, I must also have a way to hold myself accountable for improving my skills. Skill development is less likely to occur without accountability.